I found the answer: 5 micron. It is listed in the Knowledge Base Grit Comparison Table. 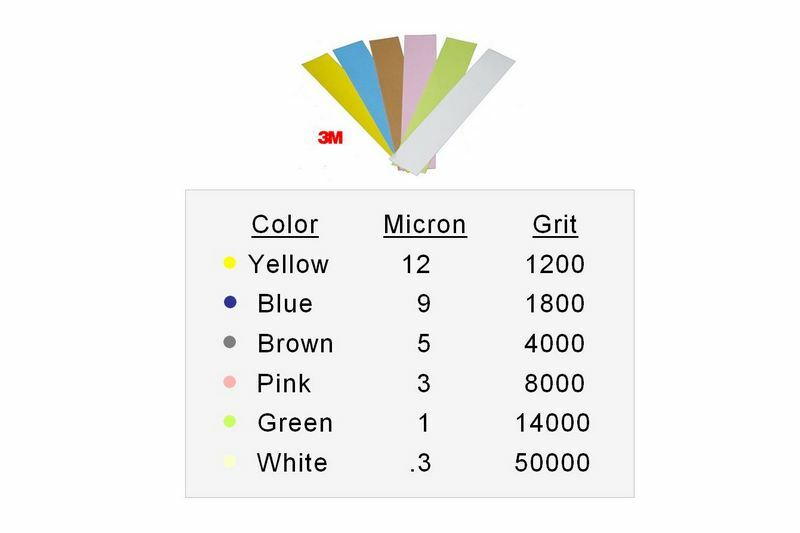 I see that the Grit Comparison chart also shows 1200 as an equivalent to 5.0 micron particles. My Advanced Abrasives chart lists 5 micron as equal to 4000 “mesh”. There’s always some disagreement on “grit” versus “mesh.” I accept them as the same. It’s just easier. No converting required. I also checked BestSharpeningStones.com, where I found that, interestingly, these guys sell 1″ by 5.5″ strips as “Wicked Edge Lapping Film” and the chart below is listed for these strips. They’re also selling WE blank handles (actual WE stuff?) with or without strips of film. I don’t know if they are buying their film or handles from WE or are just selling them for WE users. They sell a kit of eight strips each of 9, 5, 3, 1, 0.3 microns for a very reasonable $26.95. They also sell 8.5″ X 11″ sheets at $6.96 each, which is pretty close to Nanolap prices. Before buying, I would ask if their lapping film is indeed of diamond abrasives, as they left that word out of their descriptions. Indeed it is quite complicated, which is why I have spent a great deal of time creating the GLGC in an effort to demystify these things. I think it unwise to conflate grit and mesh, since there are many different definitions for both grit and mesh, none of which are equivalent IIRC. Your image matches 3M aluminum oxide lapping films, not diamond, as you can see by consulting the GLGC linked above. For our purposes, the numbers, whether grit or micron-size, are unimportant, except to give us a scale of relativity. It would serve us just as well if we labeled them one, two, three, four, etc.. We’d only need to resolve the apparent conflict regarding the ceramic stones, and I think that users should evaluate the relative scratch patterns produced by their particular stones to establish the sequence, as there appears to be some differences from stone to stone. We’re still working to clean this up and hoping to finish our project with Los Alamos National Labs this year. The plan is to use their SEM to image the scratch patterns produced by all of our abrasives and create a new grit chart that shows scratch width, depth and density. Then we’ll co-list the scratch data alongside the abrasive particle size as stated by the manufacturer. From there, we’ll develop a grit system something along the lines that tcmeyer describes above. I think sticking to a size referencing or size numbered nomenclature makes more sense to most experienced users then adopting a new arbitrary though ordered nomenclature like a,b,c or 1,2,3. At least the old nomenclature though not perfect gives the user an idea or sense of size comparison as it fits into, or compares with, our past user experiences.